We, people’s organizations and movements from 12 countries and territories representing workers, farmers, fisherfolk, indigenous peoples, migrants, refugees, women, youth, urban poor, and anti-war activists gathered here in Manila, Philippines on November 10-15, 2017 for the “International Solidarity Conference to Resist US Imperialist-Led War and Build Just Peace” and people’s protests organized by the International League of Peoples’ Struggle-Asia Pacific and Bagong Alyansang Makabayan. They are colluding in using intergovernmental forums such as the Association of Southeast Asian Nations (ASEAN) and the Asia-Pacific Economic Cooperation (APEC) and other imperialist instrumentalities such as the Regional Comprehensive Economic Program (RCEP) to push economic liberalization that will subject the toiling people to worsening forms of oppression and exploitation. But inter-imperialist rivalry is now intensifying geopolitical struggles and social conflicts all over the world. Imperialist states, led by the U.S., are becoming ever more aggressive in capturing and controlling more territories as sources of raw materials and low-cost labor, as captive markets and supply routes, and as launching pads for projecting military force overseas. To try to preserve its global dominance the U.S. is waging permanent warfare in the name of combating terrorism throughout the world. In fact, the U.S. military has trained and supported proxy armies and paramilitary groups including jihadists such as Al Qaeda and the Daesh (ISIS/IS) to destabilize countries not aligned with U.S. imperialist designs and crush liberation movements in the oil-rich region of West and Central Asia and North Africa. The U.S. is expanding its global military bootprint by establishing a new network of bases in countries stretching from Africa to East Asia. These serve as launching pads for U.S. military intervention, destabilization and aggression as well as intelligence activities and counter-insurgency operations in all corners of the planet. US imperialism is hell-bent on trying to stop its strategic decline and preserve global hegemony, especially in the Asia-Pacific which offers the biggest potential for capital accumulation, against the rise of Chinese monopoly capitalism and other rivals such as Russia and their allies. Still pursuing a multi-pronged “Pivot to Asia” policy, the US is escalating militarization in the Asia-Pacific and raising the risk of open military confrontation and war that imperils peace and the future of the peoples of Asia and other regions. Southeast Asia is one of the flashpoints of rising inter-imperialist rivalry, mainly over control of the South China Sea maritime routes. Using the “ISIS threat” and “high seas piracy” as justification, the US is stepping up joint exercises with the militaries of the Philippines, Indonesia, Malaysia, Singapore as well as with Australia. The US engages in war provocations against the Democratic People’s Republic of Korea’s (DPRK) assertion and exercise of national sovereignty and the right to national defense. Together with south Korea and Japan, it has sought to discredit the DPRK for nuclear and missile testing, and has heightened the tension in the Korea Peninsula. It is now supporting the rearming of Japan beyond self-defense as a pro-US bulwark against the DPRK as well as China. The US has also conscripted India as “Major Defense Partner” in its Indo-Pacific strategy of encircling and containing China. The US now has access to Indian military bases to service its warplanes and battleships. The US is also expected to step-up support for the Modi regime’s counterinsurgency campaigns and suppression of people’s resistance and people’s war in India. Militarism and state violence are likewise heightened by local reactionary ruling elites in collusion with imperialists and transnational corporations. In many countries, activists, grassroots organizations, and social movements that are asserting people’s rights and opposing government corruption or policies that favor foreign capital and local elites are tagged as “extremists” or even “terrorists.” They are subjected to surveillance, harassment, torture, assassinations, abductions, forced evictions and even massacres by state security forces, often with the aid of paramilitary groups. In response, peoples’ protests against these atrocities are spreading and working people are demanding an end to militarization and imperialist wars of aggression. All over the world, people are pushing back against the presence of US troops and bases – in Japan, Korea, the Philippines, Australia, New Zealand, Turkey, Honduras, El Salvador, even in Italy and Germany. Peoples movements’ in the Philippines, India, Indonesia, West Papua, Palestine, Kurdistan and other oppressed peoples continue to wage militant and valiant struggles for freedom and democracy. Even in the U.S. and other imperialist countries, the people are increasingly opposing the wars that their governments are waging in their name. 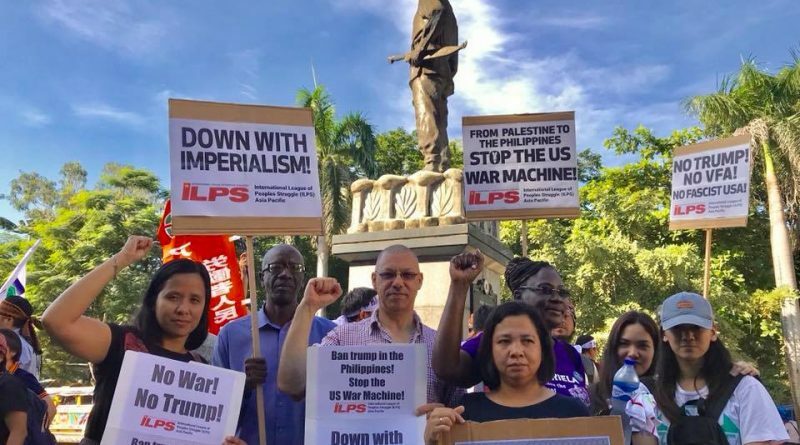 We therefore commit ourselves to further build and strengthen the Global Movement to Resist US-led Imperialist Wars and Build Just Peace that was launched at the ILPS Solidarity and Fightback Conference in Toronto, Canada last 7 August 2017. We support the Ban the Bases Network and its aim of dismantling the global network of U.S. bases. We demand the immediate pull-out of all U.S. troops and military bases overseas. We demand the scrapping of security and defense agreements that allow the US military to project its power and wage aggression abroad. We demand an end to joint military excercises led by the US that are dress rehearsals for imperialist war. We support the independent and peaceful reunification of the Korean Peninsula. We challenge the U.S. to finally sign a peace treaty to end the division. We demand the demilitarization of the East and South China Seas. Settle disputes in accordance with international law. We denounce the rearming of Japan beyond self-defense. We strongly condemn the US-Duterte regime for the killings, bombings and continuing militarization in the Philippines. We denounce the Widodo regime for the brutal repression of the Indonesian people and the occupation of West Papua. We support the struggle of the people of West Papua for self-determination and liberation. We call for an end to political repression and militarization in Manipur by the Indian state with the support of US and other imperialist forces. We support the Manipur people’s struggle for self-determination and liberation. We support the Kurdish people in asserting their right to self-determination and fighting back IS/Daesh in the Middle East. We call for the immediate release of Kurdish leader Abdullah Ocalan and all political prisoners. We are all prepared to face Trump’s “fire and fury”. We are ever more committed to fight for people’s rights, sovereignty, democracy, peace, social justice, ecological sustainability and social transformation that addresses the roots of armed conflict towards Just Peace. ← Ban Trump! Resist the fascist US-Duterte regime!